Home / Uncategorized / Beribboned! Hot on the heels of Bedazzled, is her sister Beribboned! This is another interlocking design, which features two fabrics that cascade down the quilt top like interlocking ribbons. (If you follow the pressing directions, all seams lock, which makes it really simple to put together.) It uses only 2 blocks and they are simple! This time I used a white background with 3 Kona Brights charm packs, but you could use prints too! Oh – please send pictures! 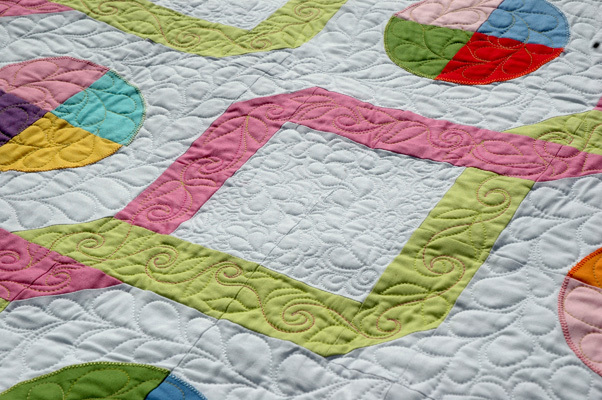 Look how she used both ribbon colors in the quilting so the green pops on the pink and vice versa! I really love the litttle echoed feathers that curve around themselves in the background. Really, really love them. Thanks, Deborah! Next up… “Bejeweled”. Think yo-yos. Lot and lots of yo-yos. A really good quilt to travel with. 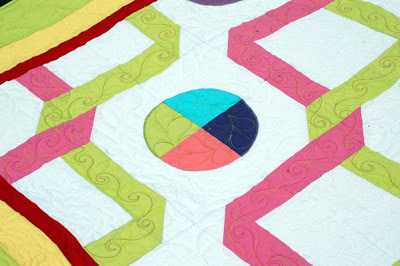 But, before then we have another Quilters Newletter giveaway so I’ll be back tomorrow! 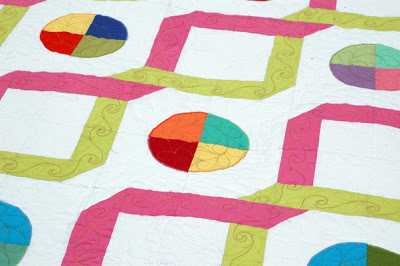 Next post: Another Quilters Newsletter Fat Quarter Issue Giveaway! Thumbs up! Super cute and simple. My kind of project. That's very pretty and the quilting is beautiful. It looks great Amanda and is so pretty in person. Loved getting to see it tonight! Oh my goodness, Amanda!! 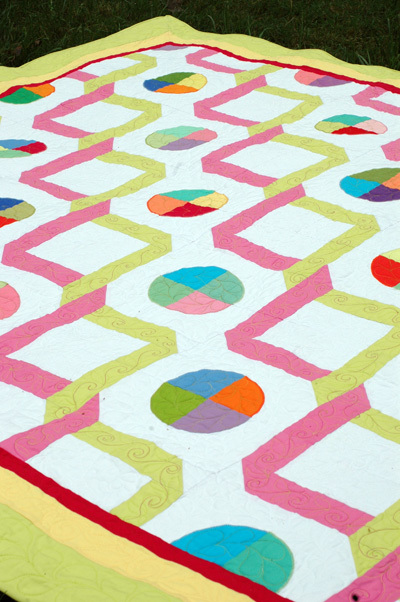 I just saw Beflowered on the Fat Quarter Shop's "comming soon" section, and I just had to tell you that it is breathtaking!!!! I also love your "Bejeweled" and "Garden Jewels"!!! 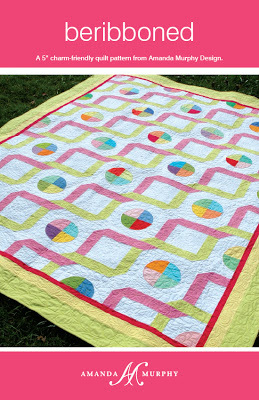 I don't usually buy quilt patterns, but those are going to be mine soon 😀 I also LOVE your Veranda Line: it is amazingly beautiful!!! have a great weekend!! Nice, yo yos next, hmmm. can't wait to see. Super great pattern! 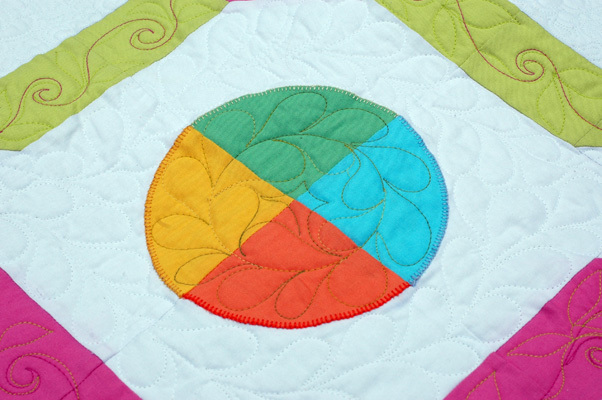 Love the use of the solids in this pattern. Well done. Really gorgeous pattern. It flows beautifully. I'm leaving this page open as a hint for a birthday present now! 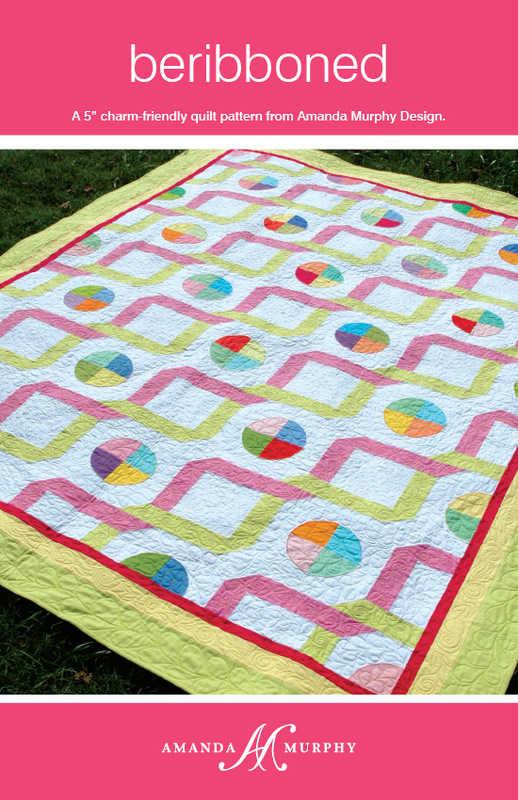 Oh this is another gorgeous pattern that I must have. Wonderful work again Amanda.